1971 Topps Greatest Moments Baseball is considered one of the rarest sets made in the 1970s. The over-sized cards are believed to have been a test issue with limited distribution. Today, finding cards in decent shape is a tough -- and often pricey -- task. The set focuses on major achievements from the era. 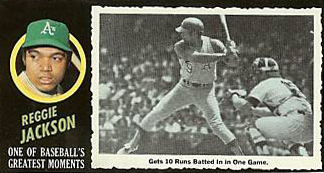 Measuring 2 1/2" by 4 3/4", 1971 Topps Greatest Moments Baseball card fronts have black borders, similar to the main 1971 Topps Baseball set. The left side of the card has a player's head shot floating inside a green circle with their name in yellow underneath. The cards also read "One of baseball's greatest moments." Next to this is a large black and white photo with a rough border and a caption, similar to what you'd find in a newspaper or magazine. Card backs continue with the newspaper theme. The notable achievement is a headline, with a small two-column write-up taking up the bulk of the card back. The top notes the card number on the left and that it's a series of 55 cards on the right. The write-ups are made as though they appear from a local paper. Of the 55 cards on the 1971 Topps Greatest Moments Baseball checklist, 22 of them are double prints, making them more common than the rest of the set. Willie Mays, Pete Rose and Bob Gibson are among the set's double prints. The strong checklist also includes Thurman Munson, Reggie Jackson, Brooks Robinson and Johnny Bench. It is believed that distribution of 1971 Topps Greatest Moments Baseball was limited to the New York area. Because it's a tough test issue, there isn't a lot of definitive info available about it. What is known is that the set is extremely tough to find in decent condition. The black borders are notorious for dings and edge wear. Also, their non-traditional dimensions made them harder to store and often led to further damage. According to this article from PSA, it's also believed a significant stash of cards were involved in a warehouse fire. While some survived, it has led to water-damaged cards making their way to the market. No matter the reason for their rarity, 1971 Topps Greatest Moments Baseball is considered one of the crown jewels of oddball baseball cards. High-grade cards don't come cheap, but raw, off-condition examples can be found. 1971 Topps Willie Mays “Baseballs Greatest Moments” #41 VG! PSA! Rare Card! 55 cards. Double prints are noted.